First of all, did you know you got free beer and wine on an international flight? Well you do. First big win of the trip. I'm going to try my best to just give you the highlights of our trip to Italy, and not inundate you with a million pictures. Hope you enjoy! We arrived at the airport in Rome and found a taxi driver that agreed to take us to our hotel. Ten minutes later, he conned us out of 50 Euro by taking us to the WRONG hotel. I then became very apprehensive about the rest of our trip, but this turned out to be the biggest snafu of our trip, so I'd say we did pretty good overall. We finally got to the correct hotel, and checked into our room. Our room had a beautiful view of the city center, which you can see below. We found a cute little pizza place down the street from our hotel and enjoyed our first authentic Italian pizza (with sausage and mushrooms) which cost like 6 Euro. Despite the fact that we had just arrived in Rome, and should be doing all things Italian, we were exhausted from the red-eye flight and time change, so we took a much-needed nap (don't tell anyone). 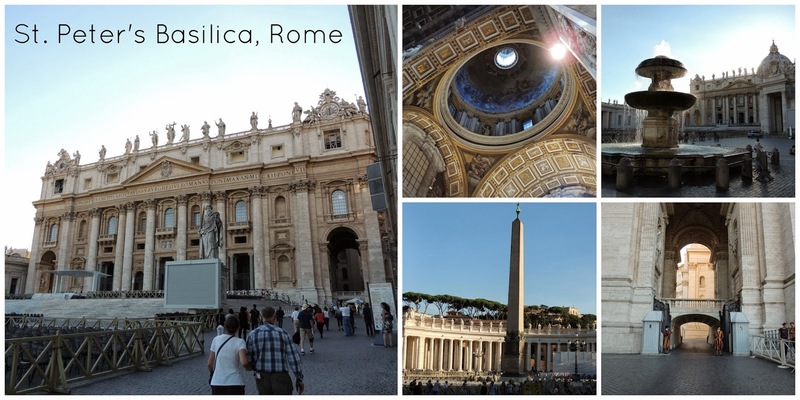 Then we made our way to Vatican City and toured St. Peter's Basilica and the surrounding areas. We walked across the Tiber River and found a great little restaurant for dinner where we were able to sit outside and people-watch. It was a perfect first Italian dinner of homemade fettuccine with porcini mushrooms (and a liter of wine) at Restaurante Il Fico. And yes, wine is cheap in Italy! We pretty much enjoyed a liter of vino della casa (house wine) with each meal! While we were enjoying our romantic dinner, random chotchky-selling people tried to convince Mike to buy me stuff: roses for 1 Euro, weird light-up thingys, and even a stuffed bear that danced Gangham Style. After dinner, we passed out, Rip Van Winkle style, on the shuttle ride home. This was our one and only day devoted to sight-seeing in Italy. We tried to pack as much in as we could, because we had to leave for Florence the following day. First we saw Palatine Hill, which is one of the most ancient parts of the city. History Lesson: People have lived here since approximately 1000 BC. The original Romans supposedly lived on this hill. During the Roman Empire, this was the home of several emperors. You can still see the ruins of the palaces of Augustus (27 BC - 14 AD), Tiberius (14 - 37 AD) and Domitian (81 - 96 AD). The ground around the palaces were MARBLE. Yes, a marble ground, so the emperor's feet would not have to touch the ground and get dirty. Talk about high maintenance! Onward to the Colosseum. Everything we knew about the Colosseum we learned from The Gladiator, of course. It was crazy to think about all of the animals and people that had died here. The animals were lifted up in elevators from the tunnels below and the gladiators would never know which direction an animal would be coming from next. History Lesson: The Colosseum was built between 72 - 80 AD. During it's opening ceremonies, which lasted for 100 days, 5,000 animals and 2,000 gladiators were killed. It held 50,000 spectators. 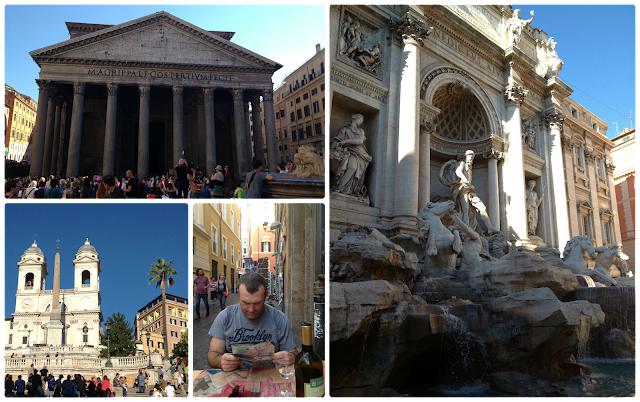 After we had seen everything we could in Ancient Rome, we walked to the area around the Pantheon. This neighborhood was filled with tiny, narrow streets, too small for cars to drive down, and restaurants EVERYWHERE. I've never seen so many restaurants. It as glorious! We stopped for a refreshing bottle of white wine (it was 80+ degrees outside) and tried to figure out where to go next. The streets were like a maze, and Siri just wasn't cutting it. We pulled out our trusty old map and ever-so-sweetly disagreed about which direction the Pantheon was. Well, one of us was right, and one of us was wrong (I won't tell you who), and we found the Pantheon. History Lesson: The Pantheon was built in 126 AD as a temple for all of the Roman gods. It has served as a Roman Catholic church since the 7th Century. Almost 2,000 years after it was built, the Pantheon's dome is still the largest un-reinforced concrete dome in the world. Next, I wanted to see the Trevi Fountain. Fun anecdote: I had been talking about the Trevi Fountain for hours by this point. Mike, however, thought I was talking about a different, more deviant fountain: the Chubby Fountain. This mis-understanding was only discovered when we were arguing, again, about the map and I pointed to the Trevi fountain on the map. T-R-E-V-I. Chubby Fountain.... Really Mike??? History Lesson: The Trevi Fountain is HUGE (86 feet high and 161 feet wide). It is the largest Baroque fountain in Rome and one of the most famous fountains in the world. 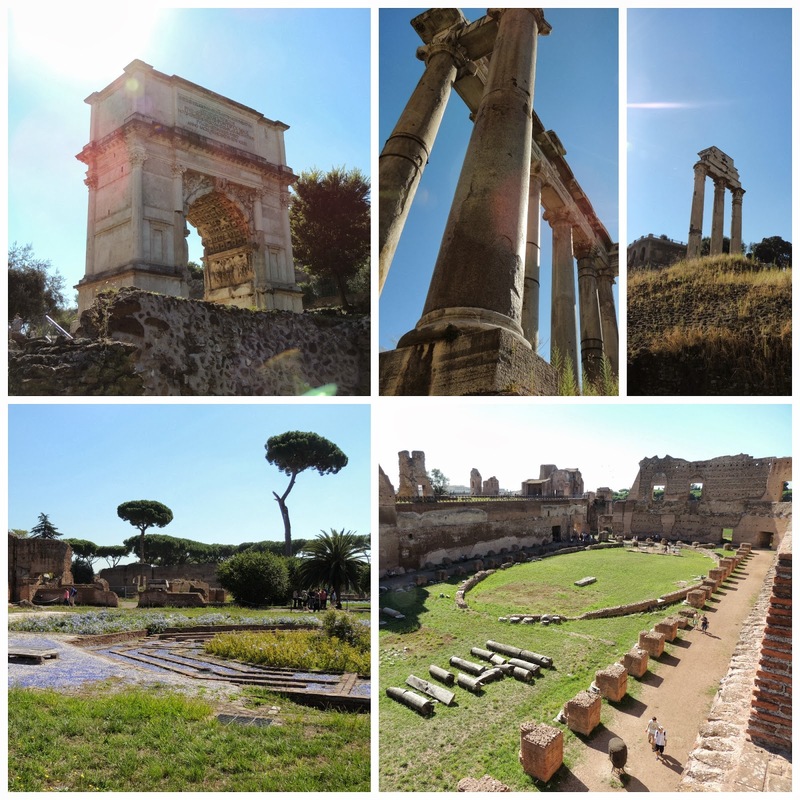 The water for the fountain comes from one of the aqueducts that supplied water to ancient Rome. Our final stop on our sightseeing tour of Rome was the Spanish Steps. History Lesson: The steps climb a steep slope between the Piazza di Spagna at the base and Piazza Trinità dei Monti, dominated by the Trinità dei Monti church at the top. The Scalinata is the widest staircase in Europe. The monumental stairway of 135 steps was built in 1723–1725, linking the Bourbon Spanish Embassy, and the Trinità dei Monti church that was under the patronage of the Bourbon kings of France, both located above — to the Holy See in Palazzo Monaldeschi located below. A metro and train ride later, we were back to our hotel. We were exhausted from sight-seeing all day, and decided to grab dinner nearby. The hotel recommended a casual family restaurant nearby, Taverna Sacchetti. It was amazing. Our waiter brought us some spicy pepperoncini garlic bread at the beginning of our meal, as a gift from the chef. Towards the end of our meal, the chef brought the entire restaurant free sauteed lamb crostini and then proceeded to walk around and talk with everyone. Pretty sure we were the only non-locals at the restaurant. I loved it. P.S. I ate a lot of pasta.